My process is ever-changing. I’m always trying to re-invent myself. Primed base coat; blended, sprayed or splattered background; luminous dabbs and stabs of leaves; methodically brushed branches and wildlife… organized chaos. The canvas or board becomes laced with acrylic, though oil is my mistress, and everything else that follows is an attempt to make abstract music. There’s a harmony achieved when what must be said is said simply… it’s when to stop talking that’s the hard part. My purpose is to be Formless. To create physical thrusts in the universe, ideas, that would manifest into matter that matters. When I arrived here, I had no recollection of my previous self, but in my hands there lay the blueprint which encourages me to encourage we through art. One night I had this dream, and in it, I was standing in a clearing amongst towering evergreens. The grass lay flat as a gust of wind struck me. The night sky was stirring and whirring and the moon shone like a lightbulb above my head. There, out of the winding clouds appeared a snow owl gliding through it. On her face sat a look of knowing and perhaps it was necessary for her to persevere. 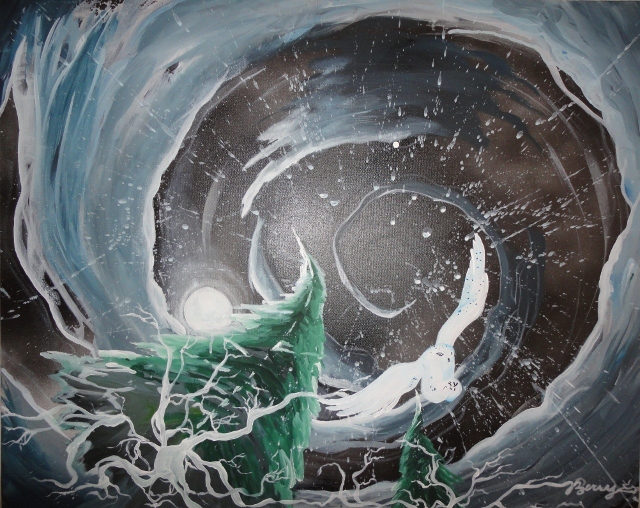 This vision would inspire “The Storm” (2012). The eldest of two light-eyed boys born in Minneapolis, Minnesota, Jendayi Maji Berry is the offspring of a Prophet and a Firefighter and since childhood has shown extraordinary promise in a number of creative fields. Yet he is best known for his visual art pursuits. Multi-panel abstract acrylic paintings brimming with vibrant colors and bold movement epitomize Jendayi’s work. As a self-taught artist, Jendayi’s middle years were filled with travel to amazing destinations – Israel, Holland, Amsterdam, Jordan, Japan, and Jamaica – these journeys have continued to inspire Jendayi’s work today. His “from the ground up” series is a visual travel journal where abstract landscapes and rambunctious wildlife are seen from an underground perspective. In his later years, Maji would go on to study Architecture and Project Management. Within 6 years as an independent artist Jendayi has experienced group expeditions at Minneapolis Institute of Art, RAW Artists Minneapolis, Public Functionary, Envision Art & Fashion show, MN4MN’s blank Canvas Exhibition, Tres Leches gallery and a feature on HGTV. His work has been mentioned in L’etoile Magazine, Minnesota Monthly, and Mpls.St. Paul Magazine. As a member of GiantStepsMN and FaceForwardMN, RAW Minneapolis’ production assistant, and recipient of 2 MEDA grants he continues to contribute to youth arts education scene. You can find his work online @ jendayiberry.wordpress.com.